CNRP leaders will meet with at least 10,000 people to report back on latest political developments. This process of consultation and dialogue with the public will continue to be implemented as CNRP develops its agenda for next rounds of negotiations with the CPP. The day Chea Vichea was assassinated was the day I joined the opposition: Juanuary 22, 2004. The 3-day of non-violent protest is over but it is not the end of the story. it is just a break. What have we gained from it? Have we reached our objective which is : truth and justice and non-violence. The meaning of power to destroy vs. the moral power to unite a nation. Mr. Hun Sen made it known to us that he watched the entire 3-day via USTREAM. We should thank him for that as he must have heard the message from the people who sold their chickens and ducks and even a man sold his dog to be part of Freedom Park. 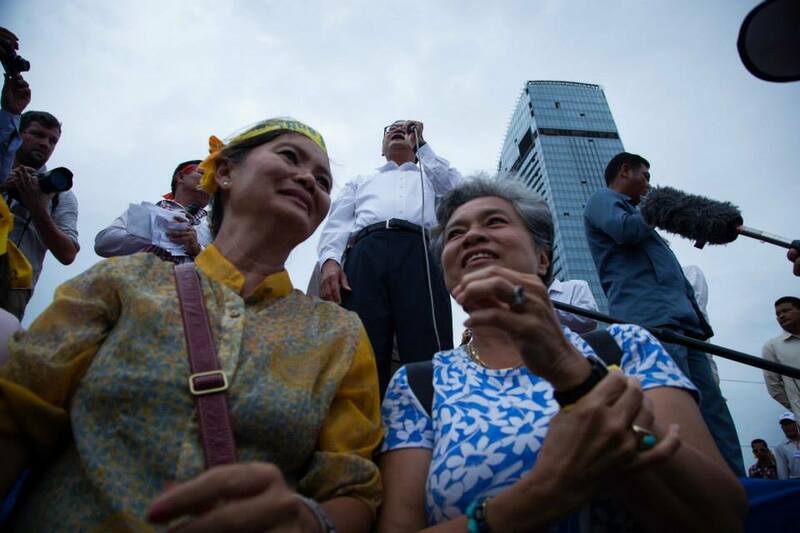 Mr. Hun Sen must have seen democracy in action and the people’s commitment to bring change for the nation. 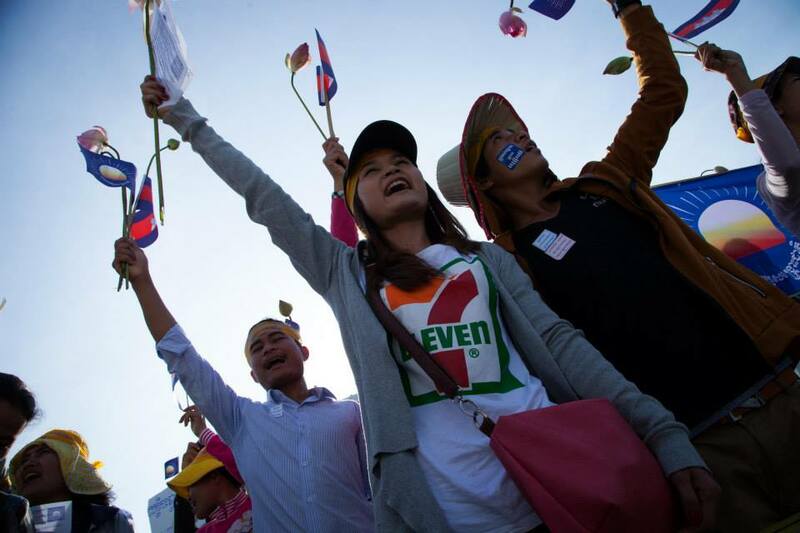 Mr. Hun Sen must have heard how many times we said : non-violence. The monk who wanted to immolate himself on stage is a very strong message of what a culture of violence does to a person and to a nation. I think that we have opened a new page together: facing this culture of violence and changing it. His Majesty is under pressure to open the National Assembly on the 23rd of September. He has to answer to his people and to the entire nation that is not in unity. 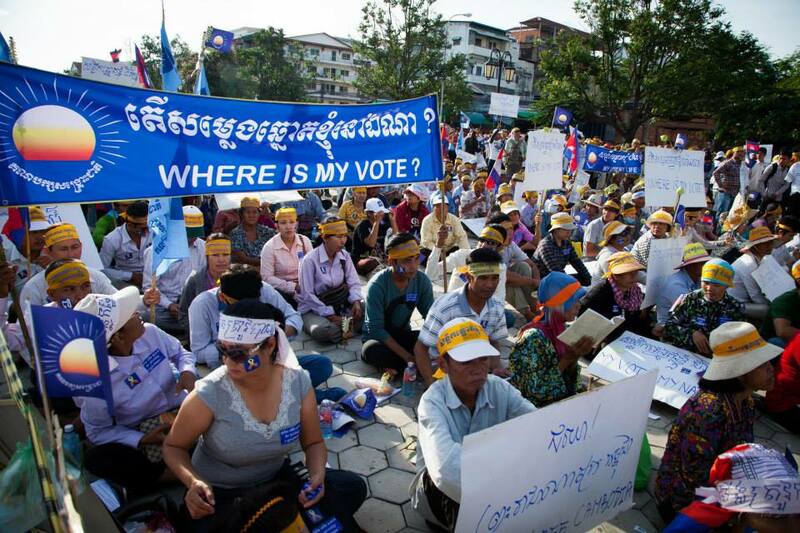 CNRP MPs-elect will not sell their conscience. His majesty says: “GO” but we say”No till the people say so”. A final word is : democracy can not be built in one day as it is a process. The people want change and we will not deceive them. We understand how many are frustrated and even want to abandon this journey. But we have to be on the same track and swim the deep seas and cross the Himalayan peeks together in order to see what is at the top. What is still in the process is truth as the CPP wants to put it out of the agenda. But CNRP keeps putting it back on the agenda and we will never delete it from our agenda. We are discussing with NGOs to find a mechanism outside of the system to establish a Truth Commission that will investigate the irregularities and develop a blue print for in-depth electoral reforms. 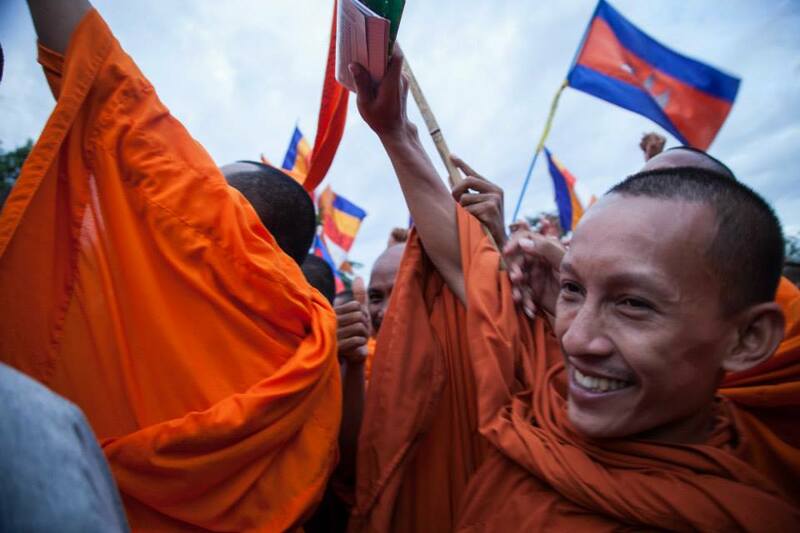 Our very deep gratitude to all who continue to be part of a new Cambodia for our beloved people who deserve true peace. Let me end with a song dedicated to our soldiers even if they aim to kill but our task is to aim to build. The Cambodia National Rescue Party condemns the use of excessive force by Cambodian police when dispersing protestors at Kbal Tnal Bridge on Sunday 15 September. This action leaves one young man shot dead, several others wounded, and a tragic end to do a day of peaceful demonstrations. We call for an urgent investigation into this act of police brutality and use of deadly weapons. On the first night of our peaceful protest against election irregularities, 29-year-old Mao Sok Chan was shot through the forehead. Hundreds of people were caught in the clashes between protestors and police, as they were trying to return home but were unable due to road barricades. As people called for the barricades to be removed in order to end the immense traffic jam, police responded with an excessive use of force. As reported by the Phnom Penh Post, “Police could be seen wielding tasers and kicking already-restrained men in the head. As they lay on their stomachs, police smashed them with batons.” The Cambodian Center for Human Rights says there human rights observers were chased from the scene, along with journalists, by state authorities. Four people are seriously injured with bullet wounds. National and international laws protect our right to peaceful protest and we continue to call on non-violent demonstration to demand election irregularities are properly investigated. We thank the tens of thousands peaceful protestors who showed up at Democracy Square, walked the streets, and camped through the night. A tragedy, a true tragedy. In His attempt to resolve post election conflict, His Majesty the King calls on the elected MPs to attend the opening of the 5th National Assembly on the 23rd of September. His Majesty’s emphasis on “national harmony and social stability” in his speech when he summonsed the leaders of CPP and CNRP is quickly endorsed by the head of the government while the leader of the opposition reiterates the need for truth and justice to voters. And that part was not covered by the pro-government media. As usual, the pro-government TV and radio stations play out the meeting at the Royal Palace yesterday. As usual, it is well crafted to deliver what the ruling party wants: the opening of parliament on 23rd September. The King’s words may be an order but the people’s voices are a moral obligation to democracy and the power of the people. And the nation is not in harmony. Art.8 of the Constitution stipulates the role and function of His Majesty in ensuring such national harmony. As we are about to camp-in for the next 3 days, I reflect on my commitment to my constituency: the majority of the population who are the women, the girls and the female youth. The great majority of the women voted for P’Dho-Change. Change for the women of Cambodia is a life without fear and a life with dignity. Without any hesitation, my response to the King’s invitation to attend the first session of parliament is my moral obligation to my constituents who bravely attend each protest, each march the CNRP has held to find truth and justice and solutions to the post-election conflict. Democracy will be strengthened by and for the people of Cambodia when truth is revealed and justice rendered to the voters. Let the people speak up and speak out. National harmony an social stability can not be imposed through order or by limiting the people’s freedom of speech and freedom of assembly. The next 3 days of democracy in action will present to the women of Cambodia, another chance to be on stage and to sing their songs and to be recognized as dignified citizens with rights. Proud to be part of this democratic process of living above fear. From 15-17 Sept. the opposition will take the mass protest back to Freedom Park with a three-day camp-in. The camp-in will have a more of a Occupy Freedom Park atmosphere with the space shared with civil society combined with music and the Gandhi film in the evening. The challenge will be toilets for 5,000 people for 3 days and nights. Leaders of the opposition are expected to spend most of their time at the park. Sunday the 15th, the first day of the camp-in will be focused on workers’ rights as 10,000 workers are expected. They will march from the outskirts of the city to the park. Authorities have not O.K. the program after 6pm but we will push ahead. His Majesty returned from a medical check-up in China, yesterday. The heads of the two parties were on the tarmac to greet His Majesty and Queen Mother but the two camps did not exchange a single word. Certain that His Majesty will call leaders of the two parties for a meeting before the 23 Sept.
We will go back to the park should there not be a solution to the deadlock by then.